The overwhelming majority of people look at me with shock and horror in their eyes when I talk about interactions with sharks. They shake their heads in disbelief when I try to convey what an amazing and not at all frightening experience seeing the hammerheads at Tubbataha was for example. Movies and TV shows and the very skewed view of sharks that they often present is one of the reasons behind these reactions. The Discovery Channel's Shark Week is one of the most popular perpetrators. Many thanks to Lesley Rochat for pointing out this very good article by Chris Palmer in the Huffington Post about Shark Week and its weaknesses. Mr. Palmer very accurately points out that in their desire to get the "money shot" and appeal to our very basest instincts in the quest for ratings and ad dollars that the conservation message is not only lost but buried under terror and hatred. Hey Mythbusters, how about a Shark Week episode where your 'sensational' story is trying to demonstrate just how extremely rare shark attacks really are? 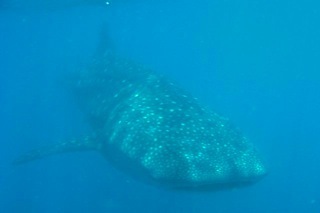 Some video of two of the whale sharks (we saw 8!!! total) from Donsol in the Philippines. One of the most enjoyable and exciting days of diving I’ve ever had. We had hammerhead sharks on the morning dives and a very playful manta in the afternoon. If you are reading this on Facebook, the video will not be embedded. You can see it on the DiveSeven site or on YouTube. Nice big manta we saw yesterday near Malapascua in the Philippines. If you are reading this on facebook, the video will not appear. You can see it on the DiveSeven site or on YouTube. There are a few manta photos in the Diving the Philippines album. What's a Whale Shark Worth? 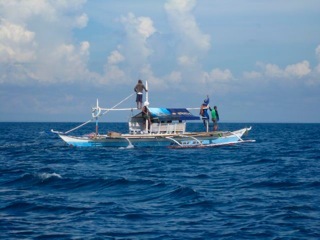 They used to fish for the easy to catch species in Donsol until the Philippines banned it in 1998. Since then, a very viable tourist operation has developed in Donsol offering ‘butanding’, the local name for the fish, interaction tours. 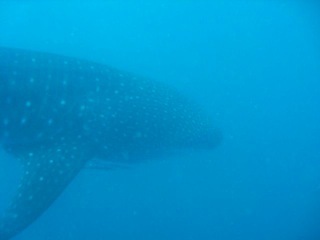 Donsol has managed to trade wasteful fishing of whale sharks for building a sustainable tourism industry offering awe inspiring encounters with these ‘gentle giants’. (In case you were not aware, whale sharks are the largest fish in the sea and can grow as large as 20M (60ft) and exist solely on plankton). Finally, a happy shark story! This figure is even more dramatic when you consider that the entire population whale sharks could be completely gone in just a few years if fishing continues. Hmmmmm. 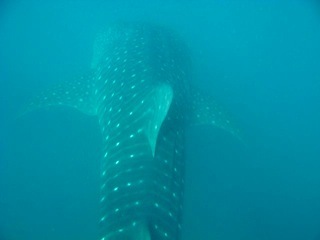 Teach a person to fish for a whale shark and they get paid for 1 day. Teach a person to amaze a tourist and they, and the hotel, and the airline, and the taxi driver, and the restaurant, and the bar, and the shop, and the ice cream vendor get paid for 60 years. This video called “Bowls of Blood” by Gary Stokes shows how a bowl of shark fin soup gets made. It shows the journey all the way from fishing port to it leaving the kitchen to the idiot’s unenlightened individual’s table. It highlights a very interesting point that the fin has to be prepared with a broth of chicken and beef stock because the shark fin “doesn’t taste very good”. It is a great reminder that as “food” shark fin soup is worthless and serves only two ridiculous purposes. First, it proves that we have dominion over all we survey, including the ‘vicious’ beasts of the sea. Second, your mommy is so very proud of you that you can waste $115 on a bowl of soup with a “not very good tasting” hunk of shark in it. “CONGRATULATIONS!!! Clearly, those opposable thumbs and higher reasoning skills have really paid off for you!! Not only do you have dominion over all you survey but hell, two words say it all: “near extinction”. WOW! Nearly flawless victory. Very well done indeed! I spoke to your mother and she is also so very proud of you and sends her wishes. She’s well up on her economics and is watching with great interest your climb up the global socio-economic ladder. She’s super pleased to say the least. She says that if you are having difficulty finding ways to demonstrate your wealth (on account of you are pretty new at this) that there are a lot of ocean preservation charities that can do a lot with $115 and will put your name on a website or something fancy like that. Standard warnings apply for this video – it’s gross. “Bowls of Blood” from Gary Stokes on Vimeo. 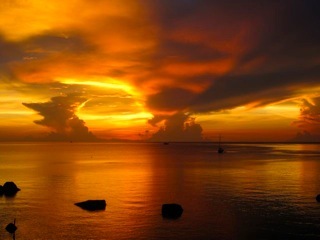 I have recently completed Beginning and Advanced freediving courses on Koh Tao in Thailand. The courses have made me a much better scuba diver and were one of the most rewarding learning experiences I have had in recent years. Disclaimer: I hope that after reading the following post you decide to try freediving for yourself. However, the warnings you read about ~never~ freediving without competent supervision are not the standard small print. There were instances during my course where if I had not been with a capable safety diver, my life could have been at risk. Please try this but please try it with professional supervision. Static Apnea – Breath holding while you are not moving. Competitive attempts are done with your face under the water in a pool or other confined water. Constant Weight Apnea – Diving with a guide line that you cannot use to assist you (by pulling on it) and the diver is not allowed to drop weights during the dive. There are ‘With Fins’ and ‘Without Fins’ versions of this. 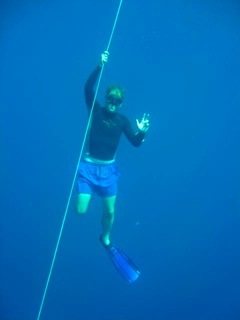 Free Immersion Apnea – Diving with a vertical guide line that you CAN use to pull yourself up and down with. You can read about all of the disciplines at Wikipedia or on AIDA’s site. The idea of trying freediving first came to me as I was touring ProDive International’s offices in Ft. Lauderdale, Florida and my guide pointed out the offices of Performance Freediving. I did not think much about it at the time other than, “hmm, that might be cool.” However, after that it was one of those ideas where you keep seeing subtle reminders. Those great shots in Sharkwater of Rob Stewart freediving in crystal clear water with the sharks. Paul Walker looking half dolphin, saving the day and getting the girl in “Into the Blue“. The clincher for me however came in Malaysia when I surfaced from a 40M dive and my buddy had used 50% less air than me. Now, my air consumption is not superhuman or anything but it’s below average and a 50% difference got my attention. When I asked him how he did it, the answer which you probably can easily guess was “freediving”. I proceeded to question him about this for the entire boat trip back to the island. With ideas about respiration rates, breathing techniques, yoga, and more swimming in my head, I had become convinced I needed to see for myself what this was all about. As luck would have it, my next destination was Thailand and the only one of the only freediving schools in SE Asia is on the island of Koh Tao and is called Apnea Total. 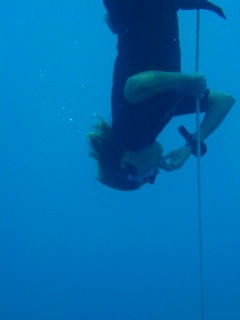 I arrived on Koh Tao and was enrolled in a Basic Freediving course with Apnea Total the very next day. Their beginning course is 2 days long and teaches you to dive safely to a depth of up to 20M (66ft). The course starts out with a general discussion of freediving, the equipment involved, and the various disciplines. Then, you get into the good stuff and immediately learn why hyperventilation, as you might have tried when attempting to hold your breath, can be a bad thing while freediving. (It raises your heart rate and overloads your system with oxygen reduces the concentration of CO2 in your system making it easy to hold your breath in the beginning but hard in the end and makes you susceptible to ‘shallow water blackout’.) The correct beginning breathe-up technique is slow and starts from low in the abdomen and finishes in the chest. The exhale is long and slow to help you relax and lower your heart rate. On the first day we practiced ‘duck-diving’ and began to see what a difference being efficient in the water makes. The muscles in your legs are some of the largest in your body and they use a lot of oxygen. Using them efficiently is one of the keys to success. Continuing on from the initial parts of the course the topics kept getting more and more interesting. We went on to learn more advanced breathe-up techniques as well as yogic breathing or pranayama. After we were taught a couple of the simple pranayama exercises I began to do them in the morning before going to class. I was amazed at how good I felt after doing these exercises. The first technique we learned was called a kapalabhati and you can see a description at Yoga Journal. The second technique was called Anuloma Viloma or ‘alternate nostril breathing’. You can see a good description of that on the ABC of Yoga site. Try these techniques for a few days and see if you do not end up doing the same thing that I did, googling for more information and trying to find a book to learn more! One of the most popular seems to be Light on Pranayama by B.K.S. Iyengar. The second surprising and fascinating part of the course for me was just how much of freediving is controlled by your brain. This is BOTH physical AND mental. Your brain consumes 30-40% of the oxygen in EVERY breath you take. Think about that for a second…and as you think about that…your brain is using MORE oxygen! As you prepare for a breath holding exercise the breathe-up has a lot of goals. You want to saturate your tissues with oxygen, relax and slow your heart rate, and begin to ‘calm’ the mind. This is the same as the ‘efficiency’ I mentioned above except amazingly it’s not about using your muscles efficiently but rather the 30-40% of your oxygen being used by the stuff between your ears. I began to notice the mental aspects of freediving on the second day of course. I noticed that it made a huge difference when I simply ‘felt right’ before attempting a dive. However, during the Advanced Course is when I got my first real lesson in exactly what your mind and brain are capable of in apnea exercises. Have you ever tried to hold your breath a long time and towards the end you start to get little ‘hiccup’ types of contractions? Well, these contractions and the generally uncomfortable feeling of not breathing when your body really wants more oxygen are the realm where the mental game is played. These contractions, contrary to what I used to think, are not you knocking on death’s door but rather, as my instructor was fond of saying, “your very good friends coming to help you”. These contractions are your body’s way of getting the remaining oxygen you have in your system distributed around your body. Your breath hold exercise can continue for a minute or more after these contractions start IF you can stay calm. So, it is here that you start to sense the ‘zen’ of freediving. Your mind is what gets you in the end. As I said, before I started the course one of my main goals was to improve my scuba diving. On that front, the results were tremendously better than I could have ever expected. Even on my first scuba dive after the course, my air consumption had improved. How did I do it? Long, very slow deep breaths starting in the abdomen and finishing in the chest. What does this do? Your respiration rate is lower and the air that you take into your lungs goes first to the lower and more capillary-rich parts of your lungs. I expect this to improve more with practice. The second part was a bonus that I had not expected. I became much more comfortable with knowing what I’m capable of underwater. All of the sudden a swim to track down a straying buddy “in the unlikely event” of an out of air situation even on half a breath does not seem so daunting. In other words, I think that my freediving experience has made a ‘panic’ situation a lot less likely. That’s a great thing. If my experience is any indication I think setups like Performance Freediving sharing offices with ProDive International will become common. There is simply too much that the sports have to gain from one another. I also think that getting a freediving instructor rating is a great way for scuba diving instructors to differentiate themselves and open up a whole new line of business for the shops they work at. When we started the course the instructor was careful to point out that this course was ‘not about the numbers’. Our goals were to learn good techniques and focus on the foundations of good freediving rather than exclusively on ‘how long’ and ‘how deep’. I have to admit that at the end of the course, this statement was MUCH more clear to me than at the beginning. My favorite aspects ended up being how good I felt physically and being introduced to the mental aspects of the sport rather than the simple ‘numbers’. It is interesting to see what one ordinary person can achieve after 5 days of competent instruction though. Before the course, the longest I had ever held my breath was around 2 minutes 30 seconds. After a proper breathe-up and discovering that thinking about college football is what keeps me the calmest, I held my breath for 4 minutes and 51 seconds. On the first day of the basic course I was stopping at less than 10 meters when I felt the first pangs of ‘discomfort’. On the second day of the basic course I was able to go down to 20 meters (66ft), stayed calm and relaxed for a 20 second count and made my way back up the line. On the final day of the Advanced Course I made it to 34.4M (113 ft) on a single breath. It’s not that I don’t enjoy you being here and saying to yourself, “Wow, almost 5 minutes! !” but it just wouldn’t be fair not to show you what people are ~really~ capable of. Check out the current records on the AIDA website. This video shows Erin Magee of Performance Freediving setting the US Women’s Record for Constant Weight just a couple of weeks ago in the Cayman Islands. (Readers on Facebook can see the video here). Erin Magee U.S. Woman’s Constant Weight National Record from Performance Freediving on Vimeo. Hold your breath for at least 4 minutes. Dive down to wave to your tech diving pals at 40 meters and surface on a single breath. Improve your air consumption while scuba diving. Improve your breathing while just doing…..anything! Learn to focus your mind and see what you body is really capable of doing. Take photos at 20 meters without those annoying bubbles to scare the fish away. Have I convinced you yet? Try freediving. You will love it. An article from The Independent in London titled "Is it time to stop eating tuna?" combined with my earlier post about Imitation Crab Meat potentially being shark meat has pretty much killed my desire to eat sushi. The article was motivated by a piece of research from the Sackler Institute for Comparative Genomics and Rutgers University studying levels of mercury in different types of tuna using DNA barcoding. They found that "although levels are highest in top-level predatory fish, some fish that are lower on the food chain have high levels. The levels of mercury in some tuna are sufficiently high to provide a health risk both to the fish themselves and to the predators that eat them, including humans, particularly those who eat fish frequently." The authors propose that the ability to identify species in the marketplace through the use of the DNA barcoding would allow regulatory agencies to more accurately measure and manage the risk posed to consumers. You can read the full study on the Royal Society Publishing site. My pal Drew forwarded this link to a TED talk by David Gallo showing “underwater astonishments” after he watched the ‘bracing’ Jeremy Jackson talk that I posted a few days ago. Gallo’s presentation is like a spoonful of sugar after Jackson’s medicine. The beginning parts on bioluminescence are pretty good but the highlights are later in the video with two squid mating and the talk finished with an octopus that gets a standing ovation. If you are reading this on facebook, the video will not be embedded. You can see it on diveseven or directly on the TED site. The TED website describes this video from ecologist Jeremy Jackson (sometimes called ‘Dr. Doom’) as ‘bracing’. Umm, yeah, I’ll describe it ‘remove all sharp objects from your general vicinity’. The images and examples he uses are very powerful. I was left however, with two major critical requests. First, it ends up being too short. I wish this had been an hour long lecture instead of 18 minutes. I found myself wanting a lot more information. Next, the McLean quote above is exactly what came to mind after I watched it. I wish he had more time to describe different options being studied to help improve the situation. It’s worth watching for the examples he describes of algae, red tide, coral bleaching, and jellyfish infestations. These are all concrete ways to visualize what is happening in the oceans (and get very worried).